In the past two years, I think that we have all seen the writing on the wall. It is worse than we can possibly imagine, too. The Democrats have taken a booming economy and in the not quite three years they have controlled our country, they have destroyed pretty much everything. That got me to thinking about how I was going to afford to EAT. I started playing with the internet to see if there was possibly a way to make money, avoid the overwhelming suffocating regulations imposed by those morons in DC, and try to move forward with growing my empire. Needless to say, the learning curve was huge. I put up the first website I ever made back in 1998. It was to peddle the "Fish in a Vase" concept. I think that my wife and I made about a grand profit, all told. Of course, there is not a really good way to ship FISH. I think that somewhere in my vast array of storage, that site still exists. I would love to find it, too. But, even then, I knew there was a way to make money online. Since late last year, I have been playing with traffic-getting methods, trying all kinds of content distribution, reading everything that I could get my hands on, and subscribing to hundreds of sites and newsletters. Dude, the information is overwhelming and I had not really moved any closer to my goal of the EMPIRE LAUNCH. Anyhoo, I got sick last week. Man, I have an ear infection that will NOT quit. For those of you that do not know, I have had NINE ear surgeries in my lifetime. I am totally deaf in my right ear and have marginal hearing in my left. Yes, I read lips well. (Yes, I notice your TEETH, too!) But, on the rare occasions that I get an ear infection, dude, it is damned bad. I have not strayed from the couch for quite a few days, but I have been studying and getting prepared. All that said, finally, I am motivated to just flat out launch everything that has been banging around in my head for months, NAY! years. Oddly enough, there are some bigger players that I have been reading and following that have two big launches this week. Dave Navarro has launched a great coaching program that is sure to be huge. All kinds of blogging biggies, internet marketers, and online merchants are involved and just the freebies that he is offering can help anyone exponentially increase their knowledge and effectiveness. The links are at my affiliate blog. I would appreciate you registering on my blog, too, if you are interested in generating some online income. No, you know me, I ain't no spammer. Besides, I am just starting this thing anyway, what am I going to do, send you photos of the laziest dog and cat on Earth? Also, one of the first sites that I joined when I started this quest for knowledge was Andy Jenkins' Video Boss. I really enjoyed watching his stuff because he is funny and the production quality is mucho slick. Obviously, he has many years of production under his belt and the videos that he made were phenomenal. Then he disappeared for a while. Late last week I got an e-mail from Jenkins giving me a heads up on a pre-launch that was starting this week and explaining his absence. I signed up to push the product not even knowing what it was. Last night I got the initial e-mail describing what I was to be selling. I watched the first video today for Kajabi. Man, the hype they are pushing is kinda over-the-top, but they have already used it for four launches to date. All four launches were huge successes, too. Anyhoo, again, go check out the first pre-launch video, it is twenty-four minutes of good looking stuff. I think that I have a bromance with the way Andy Jenkins sounds on the video. Of course, having already watched all the Video Boss series, I know how he makes himself sound like that, too. Oh, before I forget, after many months of trying to find someone to learn from that did not sound like an utter fraud and charlatan, I happened upon Eric Holmlund at Eric's Tips. Dude, I have been going through his FREE video series and it is very informative, starts at the very beginning, and progresses nicely with action steps after every lesson. If you are even remotely interested in trying to make supplemental income online, I cannot recommend Eric's series of videos enough. Here is Eric's first lesson. To the right of the video is the sign up thingy. You get five free e-books with your sign up. He sends one e-mail a day with the link to the lesson. If you are really studious, you can figure out the link to the next lesson and move a little more quickly. Do you see how? Yeah, I knew you would. Remember, join my e-mail list at the top of this page, YOU. Just hit the big G-Mail icon thingy and sign up. I am not going to make it a habit of posting internet marketing things here, by the way. I just do not have anything going on at my Wordpress site, yet and I don't have the traffic that i have here. Remember, this is a money making thingy. Whew, I am worn out now. Back to the couch. Late. 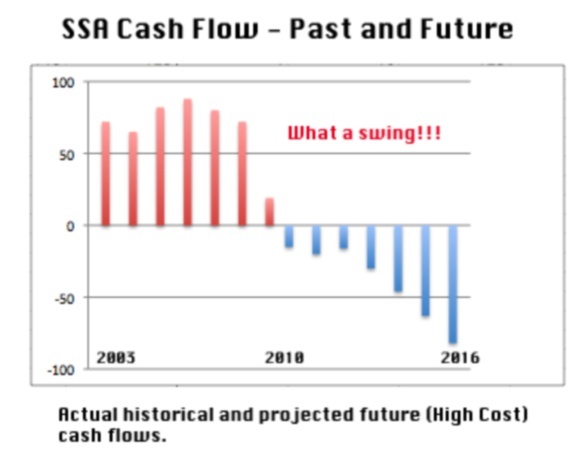 *SSA Cashflow image stolen from Zero Hedge. hmmm.... I watched the entire 24.06 of Kajabi. waht r u selling Paul? only affiliate links? or arch.? *hope your hearing recovers. like today. Marc, building is my focus and always has been. Dude, I simply cannot get it out of my blood at all. But, as usual, when Democrats are running the show, at least in my lifetime, construction goes to Hell in a handbasket. When the housing and construction market slacked off so much, coding and site building became more my focus and with that, the internet marketing gurus beat down your door. Anyhoo, information products will be my business focus and most of them will be on building, design, and construction detailing. Dangit, TD! I didn't know you were deaf. Maybe that's why you sound so weird on those videos. Hey man, get gooder...I mean, quick! I hate those dang things. I used to get an ear infection every stinkin' Fall. It's been a long time, though (knock on my wooden head). Seriously, be a good boy, and get well. Looking forward to the big launch. I have zero to offer in the way of need, or anything, but I'm looking forward to watch the progress. Very interesting, Paul. I love these marketing posts, I hope you keep them going. Get better, ear infections are indeed evil. When Clare gets one, I find that hitting her really hard stops the crying for the most part, but results may vary. Nyuk! That reminds me of when Dean was little. Somebody said that a dab of whiskey on a sugar cube would calm down his severe colic. So, I asked a Doctor friend (GP) about using a little drop of whiskey to calm down the intense screaming he went through for months. He said, "Hell yeah, Andy. When my kids had colic, I'd drink about 3 fingers, and I wouldn't hear from 'em all night!" 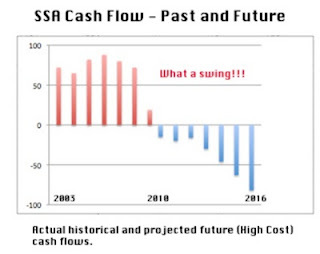 Nice Zero Hedge graphic....why haven't you renounced your citizenship yet? (not very easy to do for a "free" country like the US) The gov't is going to cover that shortfall, no matter what. They will confiscate your wealth, of course it won't be an obvious grab they could do all kinds of tricks like making a new currency (the value lost in the conversion will magically cover all the deficits) or taking gold from private owners like FDR did. How is this not going to end badly, very badly? Andy, if you think that we get a bunch of spam on Blogger, you should see the amount I get on the registrations! Mayor, I hope you mean that because I am afraid that folks will get to thinking that I am just an internet marketer. Andy, if you give the kid some Robitussin, it does the very same thing. And it works, too. Roderick, this is going to end terribly, but it is still not enough for me to want to abandon my country. I'll be here until my dying days and from the way things look now, it won't be too much longer until the starvation starts kicking in. neithercorp.us has an interesting take on why they're not leaving. They liken their response to that of the movie High Noon. Andy - I just relayed your story to someone I know, and they laughed and laughed. I told them I was the one that said the line about three fingers of whiskey, though. Damned good article, Mayor. They said it better than I ever could. Thanks. Good article for sure, Mitch! BTW, that story is completely true. Dr. N.L. Reichman (everybody called him "Rick:)...an old family friend...an Army Doctor that settled in private practice, and smoked about 3 packs of camels a day was the guy that laid that one on me. His daughter just happened to be good friends in high school with my wife, and her husband was a good friend of mine in high school (Pam and I went to different high schools, so that is really interesting. Trust me, it is). Man, those were the good old days!! !